What Should You Know Before Installing a Swimming Pool? If one morning you just wake up with the thought of having a pool at the backyard, relax, sit for a while, and think again. It is definitely not an easy task to plan, build, and maintain a swimming pool in Toronto. Major investment is involved in this process along with a transformation of your lifeless backyard into the most happening area of your house. A lot of research is required when you plan to build a swimming pool in the backyard of your house. It could be in terms of what kind of pool you want, what is possible based on the area available, and choose the best contractor for this job. This would ensure an amazing backyard modification along with the fun side of having a pool inside your premises. The most important segment of installing a pool is the planning part of it. Before the work starts, there are a few things you need to keep in mind. Asking yourself the following questions will help you in building an excellent piece in your backyard which you would just want to flaunt all the time. Why do you need a swimming pool? Sit with your family members and discuss their ideas and thoughts on having a pool out the door. If this is of great importance to you, explain them your desire to have a swimming pool. Once you know the reason for having a pool in the backyard, it would become easy to plan the work. There are different pools for different purposes. A swimming pool design used for fitness will be designed in a different way than the one used for entertainment. At times, it becomes difficult for people to understand what they really want. It is very important to consult the experts when you wish to have your backyard covered with a swimming pool. The area available, his expertise, and your budget will result in a well-designed swimming pool. Check the reasons for having a pool at the backyard. Do you want it for any kind of healing purposes, entertaining the guests, or specifically for the children in the house who want to have a good time in the water. The design of the pool will depend on the people who would use it. A children’s pool will look very different from a one used for health reasons or for spending some ‘ME’ time along the pool-side. Water features and lighting can definitely enhance the look of the pool area. So, even if you are not swimming, you can sit aside and enjoy the view. You can add benches on the side along with a bar and play area for children. You have ample of designs to select from. This would probably depend on the backyard space and the reason for installing a pool there. Customization is available based on your specifications and requirements. You just need to explain your thoughts to the design contractor and options will be available for you to select the best fit. Apart from being dependent on the swimming pool contractor, you can do some research at your end and gather information. It feels like you are out to shop for a swimming pool. Enjoy the shopping experience! Experts recommend the installation of a fibreglass pool. Though it has limitations with the size it suits best for houses in Toronto. It has really low maintenance which keeps your annual budget in place. Fibreglass pools are easy to install and have smooth edges and bottom. Other options could be a vinyl liner pool or a concrete pool. The benefit of the latter is that it can be as big as you want, however, it is also liable to getting blemished and have algae deposits. Moreover, favourable weather conditions are required to install these pools. Many experts would recommend a soil test before pool installation. This confirms if the location is suitable for the installation of a swimming pool. At times it can happen that there is a garbage dump in the area selected for the pool site. This will require extra cost as the garbage has to be removed and the soil has to be packed before you plan the swimming pool installation. The location of the swimming pool is the biggest concern. Check the size available at the backyard which will help you select the design of your pool. 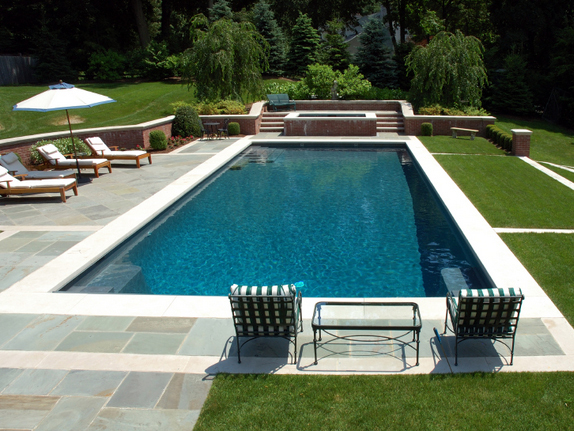 If your backyard is spread over a large area, the size of your pool could be really big. For the ones who have smaller backyards, the work of the swimming pool contractors would become a little more creative. They would need to work on special designs to fit in the specified area. The size of the pool will also include the entry and exit section. Also, many a times, people tend to look at their pool rather than swimming in it. You may need to keep this in mind while planning the location, size, and shape of the pool, so that it is visible from the rest of the backyard. The Swimming Pool design can also be based on the visibility of the pool from inside the house. Moreover, the design of the pool can also reflect the architecture of your house. This would have a complimentary effect on both. Keep in mind one thing while allocating the budget to your swimming pool – no matter how hard you want to stick to the figures, it would go up for sure. Hence, be mentally and financially prepared for this. Also, make sure to put across your financial limitations to your swimming pool contractor. He should not come up with last minute changes in the design which would increase the figures and decrease your sleep. Annual Maintenance – A Must! A pool can never be maintenance free. And Maintenance of a pool includes investment of time and money both. Are you ready for this? Either you can allocate the work to the same contractor or a different service provide can be hired. But you definitely need one! Maintenance charges can be reduced if the installation of the pool perfect keeping in mind the wear-out sections. Durable and high quality equipment can be used to avoid damage cost. With these clarifications, your pool will be designed and installed in an amazing way. You will have all the chances to flaunt in front of your friends. Be ready to through pool parties often! If you are looking for a reliable swimming pool contractor who can deliver exceptional results as per your needs, reach out to our pool experts by calling 416.504.5263. You could also fill out our form if you have any questions.